Wealth & Pension Services Group Attends 2018 Schwab Impact Conference | Wealth & Pension Services Group, Inc.
At Wealth & Pension Services Group, we’re always looking for chances to learn from and interact with industry experts. This October, MaryJane LeCroy and I headed to Washington, D.C., for Schwab’s annual, invitation-only IMPACT 2018 conference for financial advisors. Schwab is one of our third-party custodians—a brokerage firm we partner with to hold client assets—so we were excited to learn more about their business direction and plans for the future at this expert-filled event. There were also a couple of pleasant surprises along the way. Please read on! Trusted with trillions, you're why. 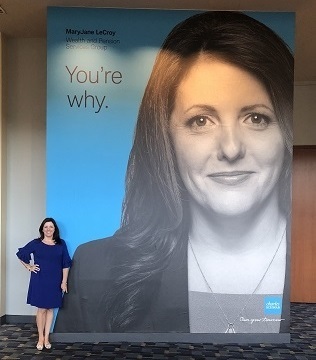 Financial advisors usually try to avoid surprises, but Schwab definitely surprised us by selecting MaryJane as one of about a dozen featured financial advisors for a new advertising campaign launched at the conference. Turns out that MaryJane took advantage of a free video recording session at last year’s conference, and Schwab liked her client-focused message enough to feature her in this 2018 advertising campaign. I guess we should have wondered what was going on when Schwab invited MaryJane to San Francisco earlier this year for a photo and video shoot. As soon as we reached the top of the conference hall escalator, we couldn’t miss the 30-foot high MaryJane poster outside of the keynote event. MaryJane was everywhere – posters, tweets, and even a Wall Street Journal wrap that led to a few double takes from other conference attendees. You’ll also probable see her in upcoming Schwab print, TV, and internet ads. It was thrilling to see MaryJane’s client-focused philosophy getting some national attention, but this will definitely not go to her head. The conference finale was a closing keynote from Janet Yellen, the former Chair of the Federal Reserve during the economic recovery. Her talk was thoughtful, informative and, as you’d expect from a former Fed Chair, eminently quotable. In fact, just 20 minutes after her talk, quotes were already appearing on MSNBC! Ms. Yellen took pre-selected questions from the crowd, and one of my questions was asked – we’ll save the answer for a future article! As a featured advisor, MaryJane got the chance to meet Ms. Yellen backstage after the keynote, a thrilling end to a terrific professional development opportunity. Wealth and Pension Services Group is an independent SEC-registered investment advisor. WPSGI provides comprehensive wealth management advice, portfolio management, and insurance services. Wealth and Pension Services Group also has a dedicated corporate retirement benefit arm, 401kProAdvisor that seeks to improve retirement plan outcomes for Participants while lowering costs and providing consultative fiduciary services to Plan Sponsors. WPSGI currently manages assets in excess of $300 million, assisting individuals, families, and institutional clients in multiple states. For more information and to learn how Wealth and Pension Services Group can help you and/or your business, please visit www.wealthandpension.com CONTACT: Michelle O’Leary 770-333-0113 x101 Wealth and Pension Services Group Inc.